Do you want to create a perfect lunch? 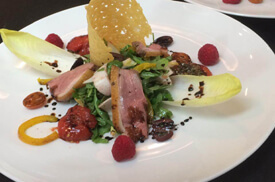 This class we will be preparing a duck salad that is a complete dish and well balanced. The presentation will be beautiful and very colorful and will feature fresh raspberries and Belgium endives. The Rosé de Provence is not part of this list but is strongly recommended! In this cooking class you will also learn how to work with puff pastry dough. You will be making a warm apple tart with vanilla ice cream and caramel sauce.